De La Grenade Industries, a leading Food Processing Company in Grenada, has pioneered the use of nutmeg pericarp (fruit) in the manufacture of high value-added delicious products── Morne Délice Nutmeg Jam, Jelly and Syrup── which are distributed on the local market and exported regionally and internationally. Sybil La Grenade, the matriarch of de La Grenade Industries and a Home Economics teacher, founded the company and showcased Grenada as a country with tremendous food processing potential through her award-winning products, which she began making from the basement of her home in a cottage industry called de La Grenade Home Products. In 1969, Sybil, recognizing the value of research in achieving excellence, quickly forged an alliance with Grenada’s newly-appointed British food chemist. Combining his training in Food Chemistry with her culinary expertise, they created a masterpiece─Morne Délice Nutmeg Syrup. In 1990, this unique and superb product, which was being processed at the cottage industry level, became the first authentic Caribbean food product to receive the highest award from Monde Selection in Brussels – a Grand Gold Medal. La Grenade Liqueur, the flagship product of the company, which received a gold medal from Monde Selection that same year, also uses nutmeg as one of the secret ingredients in its formulation. These awards opened many doors to Sybil La Grenade. Between 1990 and 1991, Sybil’s credibility as a businesswoman soared and her knowledge of the industry became widely recognized. She then had no difficulty convincing bankers to approve a loan for the expansion of her business which became a registered limited liability company operating under the name de La Grenade Industries. 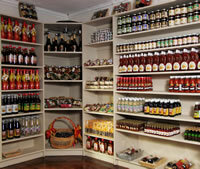 Following the sudden death of Sybil in 1991, her daughter Cécile, a Food Technologist trained in the United States, effected the transition from cottage to commercial production, and expanded the product range to include more traditional drinks such as seamoss, mauby, and ginger drinks as well as hot pepper sauce and pepper jelly. In 2009, Cécile continued the development of the company. The factory building was remodeled, the equipment upgraded, and the land around the factory transformed into a beautiful herb and spice garden open to visitors. It is our pleasure to share with you the allure and mystique of de La Grenade Industries.